Luton Town have confirmed that popular former winger Kingsley Black has returned to the club as part of the coaching staff on the football education programme at the Arena in Baldock. The 48-year-old, who himself came through the ranks at Kenilworth Road, went on to makee 156 appearancesd scoring 31 goals for Luton, as he starred in the 1988 Littlewoods Cup final win over Arsenal and also won 30 caps for Northern Ireland. Black was eventually sold to Nottingham Forest for a fee of £1.5million in 1991 and will now be coaching 16-19 year old boys every day throughout the week as part of Barnfield College’s course, ‘The Luton Town FC Football Programme’. Together with head of youth recruitment Lee Cowley, he will be casting his eye over prospective new players to join the course on Monday morning, with a trial being held at the Arena on Norton Road. The programme, run jointly with Hitchin Town, allows 16-year-old school-leavers to participate in a BTEC Extended Diploma in Sport course, giving them a minimum of 16 hours of academic tuition per week plus 12 hours of football coaching each week from highly qualified Luton Town coaching staff, which includes studying for their FA Level 1 and Level 2 coaching badges. The boys play in the Football Conference Youth Alliance against some of the top professional clubs in the country, and in recent seasons the team have won regional league and cup competitions. Speaking about his new role, Black told the club’s official website: “We are going to keep a good eye on some of the young players to see if they are going to be able to cope with the course, and have the ability to improve, because that is important. Hopefully there’ll be some good talent that we can nurture. 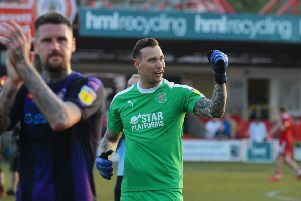 “I supported Luton as a boy and it’s the club that has a special place in my heart. The trial being held at The Arena in Baldock is on Monday, July 4 at 10.30am. For more details contact Lee Cowley on 07508 850155 or visit www.northhertsarena.co.uk and click on the Luton FP tab.